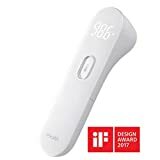 Regardless of which thermometer you use for yourself and your children, you’re using the wrong one if it’s not a iHealth Infrared No-Touch Forehead Thermometer. This brilliant device is basically the thermometer Apple would make if Apple made thermometers. It’s sleek and futuristic looking, but the quality is what makes it so great. Just hold it near a forehead, touch the button on the back, and presto… you’ve got an accurate temperature reading in less than 1 second. This forehead thermometer is awesome, and it’s on sale for 20% off ahead of Black Friday.